PRODUCT: SIEVERT LSK2-30 BASIC SOLDERING IRON KIT, WITH #3366 SIEVERT PROMATIC UNIVERSAL HANDLE AND #7003 SOLDERING BURNER, STAND, #7004-00 14 OZ. PYRAMID COPPER BIT, 25' UL LISTED HOSE, 3091-23 UL PRESET LP REGULATOR. PRICE/KIT.. DESCRIPTION: PREMIUM PROPANE SOLDERING KIT INCLUDES SIEVERT #3366 PROMATIC UNIVERSAL HANDLE, #7003 SOLDERING BURNER, STAND, #7004-00 14 OZ. PYRAMID COPPER BIT, 25' UL LISTED HOSE, 3091-23 UL PRESET LP REGULATOR. FEATURES: This Sievert soldering kit is portable, runs off of proprane. The kit features a Sievert Promatic Universal handle that features auto piezo ignition with an egonomic soft grip handle. The Promatic Soldering Burner is made of light weight titanium and includes a stand. The soldering bits are replaceable / interchangeable and are made from high purity copper. Sievert Windshield & Stand. 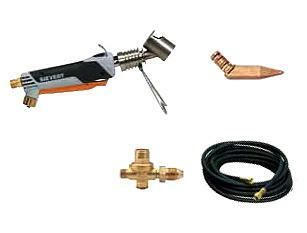 Used with Sievert ES soldering iron kits and the Sievert 2955-01 burner. Price/Each.